Rowan Blanchard attended The 68th Creative Arts Emmy Awards in Los Angeles wearing a Blumarine Blush Chiffon Gown With Flower Embroidery ($3,535.00), Alison Lou Emerald and Green Enamel Earrings ($335.00 each) and Charlotte Olympia Edna Embellished Platform Sandals ($561.00). Rowan Blanchard posed at the 2016 Teen Choice Awards yesterday wearing a Velvet-Trimmed Denim Coat ($2,890.00), a Cotton Poplin Mini Dress ($1,720.00) and Satin Pearl Pumps ($890.00). 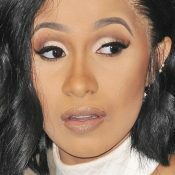 You can find a similar coat for less at ASOS ($47.50). Rowan Blanchard instagrammed a picture yesterday wearing a Ruffled Silk Crepe De Chine Blouse (€590.00 – available in white), a Corduroy Mini Skirt ($595.00) and Platform Satin-Velvet Embellished Sandals ($1,290.00) all by Miu Miu. You can find a similar blouse for less at Motel ($58.00). Rowan Blanchard arrived at the premiere of the 100th Disney Channel Original Movie “Adventures in Babysitting” on Thursday night wearing the Rachel Antonoff Larry’s Lung Dress ($206.50) and Miu Miu Bird-Print Garbadine Platform Sandals ($219.00). Rowan Blanchard attended a fundraising event for City Year Los Angeles on Saturday night wearing the Mother of Pearl AW16 Nena Dress in Scarlet Rose Pink (not available online) and a pair of silver metallic Aquatalia Wanette Sandals ($395.00). Get the look for less with sandals from Teva ($26.41+) or Dirty Laundry ($49.99). Rowan Blanchard attended WE Day yesterday wearing an embroidered off-the-shoulder top and matching sheer striped culottes from the Disaya Cruise 2016 Collection (not available online) with a pair of silver metallic L.K. Bennett Parka Block-Heeled Court Shoes ($270.00). Get the look for less with culottes from Boohoo ($18.00) and block heel pumps from Circa Joan & David ($31.95). 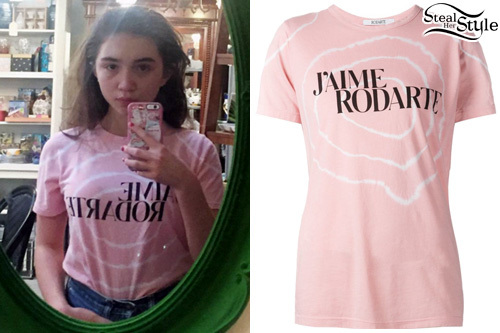 Rowan Blanchard posted a picture a few days ago wearing a Rodarte Love Hate Tie-Dye T-Shirt ($145.00). Rowan Blanchard posed at the Vanity Fair & L’Oreal Paris DJ Night a few days ago wearing a Giamba S/S’16 Mini Dress With Sequin Stars Embellishment ($2,065.00), an Edie Parker Jean Solid Confetti Clutch ($895.00) and ASOS Arkansas Leather Western Buckle Boots ($101.66).